This post is about a trip paid for by Disney. Disney did not express any expectation that I would express a particular viewpoint in my posts. I do not accept pay-per-post or pay-per-positive reviews, and on the rare occasion that I do accept a free service from a sponsor I will always let you know. I was thrilled last week when I received email from Disney offering to fly my family in for a mom blogger's event at Disneyland. Not only did it sound like a lot of fun, but it also felt like a very tangible recognition DeliciousBaby. I was also curious... what goes on at these things? What would be expected of me as a blogger? Who would be there? You can imagine that my family was excited too. Once the plans were finalized, I told the kids that we were headed back to Disneyland, and from that day, E asked me every single morning whether it was "Disneyland Day." By the end of the week he had invited his teachers, most of his friends, and even a few complete strangers to join us. Our last trip must have made quite an impression. He told me that the thing he looked forward to most was meeting Mickey again, and in fact, now that our trip is over, he still maintains that seeing Mickey was the hi-light of his trip. It's fascinating to me that a child who has never watched a Mickey Mouse movie or owned a Mickey Mouse book has developed such a strong connection with the character after a single short meeting. We woke up early on Friday morning and headed to the airport. According to my own, twisted brand of logic "it's a good thing our kids are used to traveling, because their comfort with the process makes short unexpected trips like this one possible." My thinking must be true to some extent. We tried to move the kids into the car without waking them, but as soon as their drowsy eyes edged open, they realized what was happening. At once, both children were fully awake and bubbling over with enthusiasm. They chattered happily all the way to the airport, and their cooperation was a dream-come-true as we slogged through security and onto the plane. Our single moment of drama came at landing when D literally arched her back and dug in her heels at getting her seatbelt on. Worried that we would single-handedly delay the landing, my husband desperately turned on and handed her his iPhone. The game-laden ruse worked, and somehow our eagle-eyed flight attendant (who certainly was just as worried as we were) "failed to notice" that it remained on until well after we landed. The Disneyland Hotel, where we were hosted, is one of two hotels right on Disney property. The pictures online made it look dated, and a little motel-like, but we were pleasantly surprised when we checked in. Everything was spotless, and the kids were thrilled to see Goofy waiting outside the hotel for us. Our room was not huge, but had nice touches like free wifi (a must in our family) and a pack-and-play in the closet. Disney fans won't be surprised to hear that the room was filled with "hidden Mickeys" on the furniture, the bedding, and even the wallpaper and shampoo containers. I'm sure this is too-much-information, but little D was so awed by the Mickey Mouse wallpaper in the bathroom that she agreed to sit on a "big toilet" for the first time... a strangely proud moment in the life of any potty training mom. Best of all, when I needed to buy a park ticket for my Mother-in-Law, I was able to do it right in the hotel lobby instead of waiting in line at the park's main entrance. We also had access to the park an hour before the usual opening time and free parking . I imagine that guests pay a premium for all these services, and I'm not in a position to do the price comparison that would divine whether they were a good value, but they certainly did make our visit easier. At five PM the doors opened to the Mom Blogger's event, and my kids were already amped after having explored the room, walked through Downtown Disney (an outdoor mall that connects the hotels with Disneyland), and entered the more luxurious Grand Californian Hotel. Nametags and sparkly pink wrist bands impressed my kids before they even walked in the door, but when the doors opened to reveal Minnie Mouse, they were floored. I expected shy-excitement, but instead the kids ran up to her, give her hugs and kisses and generally fawned over her. The actress paying Minnie was particularly sweet with the kids, dancing with them, giving them kisses, and hamming things up, and they returned to her (and all the characters) throughout the night. The small size of the party meant that they got lots of personal attention each time they visited one of the characters. Crafts, face painting, the characters, and my husband entertained my kids as I visited booths set up for mom bloggers to learn more about Disney's merchandise, walking tours (did you know that there's a Segway tour of the park? ), and the park's new Photo Passport service. As the kids settled in to a kid-sized buffet (chicken fingers, mac-and-cheese, and applesauce all served in Mickey sized plates) I was escorted to a presentation area where we moms would learn more about Disneyland. After the welcome, Disney's head pastry chef and assistant pastry chef gave a presentation about the pastry served at the park, showing off the themed cookies, cakes and other baked goods available for the holidays. I had never given much thought to the sweets at Disneyland. I was particularly surprised to learn that 95% of the pastry is baked by Disney and that the pastry team is 45 members strong! It must be a huge effort to make enough croissants, cookies, churros and other sweets to feed everyone who visits the park each day. The sweets change seasonally, and Disney Annual Passport holders sometimes seek out particular seasonal treats. The hi-light were pictures of the enormous gingerbread houses that Disneyland donates to the Children's Hospital of Orange County each year, followed by a live demonstration of how to make a Gingerbread house. Kids roamed in and out of the presentation area throughout the demonstration and many of the older kids stuck around to enjoy the demo too. Gingerbread house making isn't part of our family tradition, but my son was fascinated by the houses that sprung up in every Seattle bakery last year, and I'm inspired to give it a try. My favorite tip? Use melted white chocolate as the "glue" to hold the walls and roof on -- it dries much faster than the traditional frosting. We also learned about Disney's new Photo Passport service, where Disney photographers stationed around the park will snap your photo and then make it available on a special Disney website where you can purchase prints or merchandise emblazoned with your photo and Disney art that you select. 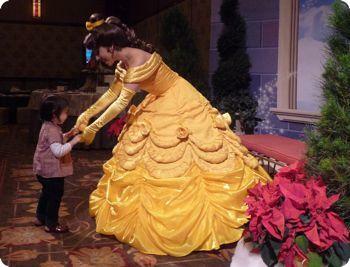 We had experienced this service first hand when the kids met Mickey at on our last trip. The staff photographer was ready and waiting to take a picture, but nobody discouraged me from posing the kids or taking my own shots in any way. When I was done, the photographer snapped her own (perfectly lighted and staged) shot, and handed me a card with a code I could use online to retrieve the photo. The same card can be used by any photographer in the park, meaning that you have only one code to enter when you are ready to view the pictures. As a business person, I think this is an absolutely brilliant idea. We're pretty good at documenting our travels, but most people aren't great photographers. The opportunity to order greeting cards, a mug or a calendar with a professionally taken photograph must be appealing to many families, especially those for whom a trip to Disneyland is the travel-hilight of the year. When the presentations were over, I ate my own dinner and hung out with the kids a bit more. My only regret was that I was so busy enjoying the party with my kids that I didn't do a better job of reaching out to the other great bloggers who were at the event. After the party ended, we were escorted to a private area to view the fireworks. Though they started long past the kids regular bedtimes, we decided to power through and enjoy the show. Definitely the right decision in retrospect. A little ice cream (certainly there's some child-development expert waiting in the wings to give me the parent-of-the-year award) and some colorful Mikey Mouse light-sabers gave the kids a second wind. Outside the roped-off plaza where we sat, it was insanely crowded, and each excursion to pick up ice cream or change a diaper was an adventure in its own right. A big part of me was tempted to end our second Disneyland experience right there, with that perfect moment, but we had promised the kids a full day of Disneyland on Saturday, so despite my worries about how we might fare (especially with children who finally fell asleep after 11pm) I knew that we'd rush to the park in the morning and enjoy it as much as possible until we all reached the point of exhaustion... because after all, isn't that what every American family aspires to do once they've crossed through Disneyland's magic gates? Aviva on December 10, 2008 at 12:05 p.m.
Ok, so personal pet peeve here first: the correct spelling is "highlight" not "hi-light" or "hilight"
Fwiw, anyone who stays in the Disney hotels gets early access to the parks. It's one of the nicest perks, and one we've always taken advantage of when we went to Disneyland. I'd love to hear more about the mom bloggers Disney chose. Were you all travel bloggers as well? I think the photo passport sounds great. I haven't been there since they started that, and you used to have to go look at your photos right away or miss out, I think. Maybe that was just the ride photos? I do remember being very impressed that they not only let us take our own photos with the characters but that they had someone at all the official meet-and-greet places who would take a photo with OUR camera for us so we could all be in it. Debbie on December 10, 2008 at 12:17 p.m. Thanks so much for stopping by! It's funny, my mac recommends hi-light but also recognizes highlight. Despite the fact that I read constantly, I'm not a great speller (as you can see) so I rely on that spell checker! There seemed to be a wide variety of bloggers, from traditional mom bloggers, to someone who runs a yahoo group for Orange Country moms, to even a real estate blogger! Most were from the Orange County area and I think that everyone was from the West Coast. Jenny on December 10, 2008 at 5:39 p.m. I love Disney and my family too! I can't tell you how many collections of DVDs we have. We were there and I, like you, was having way too much fun with my kids to get to know many of the awesome mom bloggers there. Maybe we'll just have to make friends now! Glad to see your family had just as amazing of a time as we did. After our experience, I'm convinced that Disney is the only place to be for the holidays! kelly on December 17, 2008 at 9:46 a.m.
wasn't the event great? disney did a wonderful job. great food, fun activities & very information. i just wish we had had more of a chance to meet the other bloggers such as yourself! Caroline on December 20, 2008 at 5:29 p.m.
Really cool Cindarella dress! Would love to be on the list for mom blogger and travel blogger get togethers! Lisa on January 8, 2009 at 9:49 p.m.
My family and I were at the event too. It was a wonderful way to kick off theh Christmas season.